Burmese Activist Charged After Visit By "Wretched American"
Aung San Suu Kyi, Burmese pro-democracy leader and Nobel Peace Prize laureate, was charged today with violating the terms of her house arrest after an American man snuck into her house uninvited. 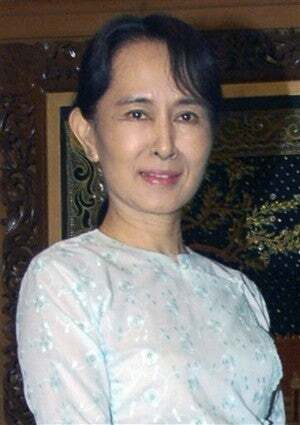 Suu Kyi is the daughter of Aung San, a revolutionary who helped Burma win its independence from Britain ("Burma" is the name used by opposition groups to refer to the country now officially known as Myanmar). She has spent 13 of the last 19 years in some form of custody, due to her pro-democracy activism and helped found the National League for Democracy, which won in a landslide in Burma's 1990 general election (the ruling military junta nullified the results). Suu Kyi, who was voted Prime Minister, was already under house arrest at the time, for giving speeches and campaigning for democracy after a ban on political gatherings. Her continued nonviolent campaigning won her the Nobel Peace Prize in 1991. The latest change in Suu Kyi's status comes as a result of the American John William Yettaw, who reportedly swam across a lake, snuck into Suu Kyi's home, and stayed there for two days. He had tried to visit her once before, in 2008; both times, she told him to leave, but this time he refused. Yettaw's stepson says he "is harmless and not politically motivated in any way." No one knows what does motivate him, but Suu Kyi's lawyer Kyi Win doesn't much care. "Everyone is very angry with this wretched American. He is the cause of all these problems," he said. "He's a fool." Burma's junta, which took power in 1988 after a bloody uprising, says that by allowing Yettaw's visit Suu Kyi violated Article 22 of the Law Safeguarding the State from the Danger of Subversionists (aka Scary Totalitarian Rule No. 1). The National League for Democracy, however, says she has violated no law. Many speculate that Yettaw's intrusion is merely an excuse for the junta to extend this particular round of detention for Suu Kyi, which began in 2003. Sein Win, Prime Minister of Burma's opposition government-in-exile, said, "It is nothing more than a political ploy to hoodwink the international community so that it can keep (Suu Kyi) under lock and key while the military maneuvers its way to election victory on 2010."